Two saxophones, two voices, two strange minds collide in new ideas and challenging music. 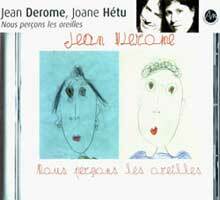 Says Derome: "The basis of our work is made of songs and improvisation. Our songs speak of our life. They are ordinary (like us) but not easygoing (like her). We really love to improvise together. It is not easy to describe accurately what we do while improvising � it is very close to the human beast that we are."